When single, have you ever found yourself saying “I’ll date when I lose those last 10 pounds”, or “I’ll date once I’m in better shape” or “…once I’m finished getting my Ph.D.”? 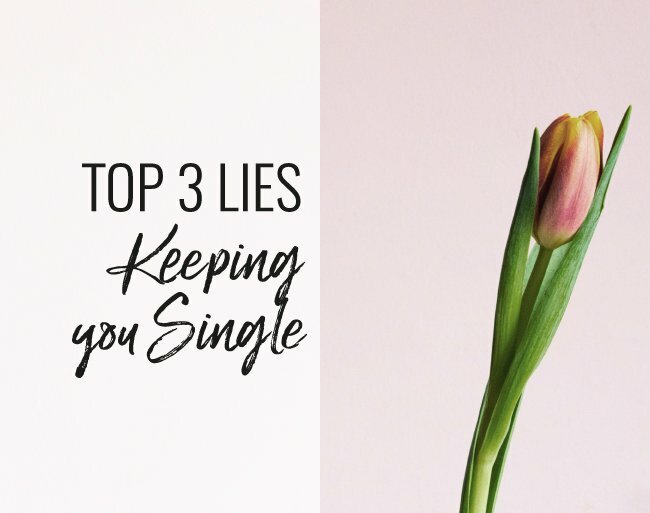 Today we are going to talk about the three top lies that you might be telling yourself that are keeping you single – or getting in the way of you finding your soulmate. Women in New York, especially, tend to believe that even though there are a million people here. They think that there are no good guys left – they’re all taken or they’re all gay. Now, have you ever uttered these words? Have you ever said: “All the good ones are taken?” It’s a very common lie that we tell ourselves. And again, if we were to look at what is the secondary gain of telling yourself that all the good ones are taken, we would find that it means you don’t have to put yourself out there. If you’ve already determined that your person isn’t out there (because of all the zillions of people out there, all the good ones are already taken or married, etc), then that doesn’t require you to take the action that maybe you feel uncomfortable taking. But this is pretty much guaranteed to result in you ending up sitting on your couch watching Netflix with your cat. ? Bottom line is that you’re doing yourself a disservice by believing the self-spun BS. We think it buys us time but really, time waits for no one. It just keeps going. I know people who have said this for years and years and years- and not just about dating. They always had a reason. They just needed to “get through this.” And in the case of staying single, you have to decide and honestly look at what lies you might be telling yourself about when you’ll start dating, or why you haven’t found the right relationship yet. Click here to join our Raise Your Love Vibe 5-Day Challenge where you’re going to learn so much about unconscious material that might be sabotaging your efforts to attract or attain Real Love. For those of you in relationships or are partnered but find yourselves thinking, “Is this all there is?” the Love Vibe Challenge will really help you boost your relationship or help you decide whether it’s the right one for you, and that’s what the masterclasses are focusing on as well. Raising your own awareness. So if you liked this Real Love Revolution video, please share it on all your social media channels. I cannot wait to see you guys in the Raise Your Love Vibe Challenge and in the masterclasses. 137 Code Red: 5 Warning Signs for Online Dating!